The Effortless Clothes Organizer lets you stack your clothes into neat, easily visible and rapidly accessible piles. Want that classic t-shirt from the bottom of the stack? Go ahead and grab it. You won’t even ruffle the rest of the pile. Made in the USA from recycled plastic, each interlocking divider fits deftly into the next for easy arranging and re-arranging. Stack them high. Stack them low. 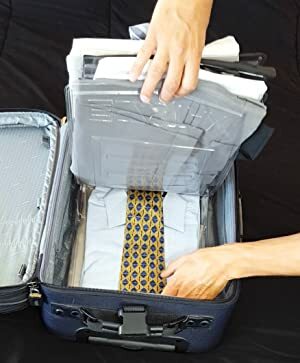 At 11.5” wide x 13.5” deep x 2” tall for the regular size, Effortless Clothes Organizer is your ultimate personal organizer. So versatile, it works in your dresser drawers, closet or shelves. Travel would be so much easier if you could take your dresser with you. This turns your suitcase into the next best thing. Each rigid plastic organizer lies flat and steady – protecting your clothes from getting squished and wrinkled, even during bouncy rides. And just like your shelves at home, This lets you pull an item from the middle or bottom of the pile, leaving the rest of your clothes undisturbed. It’s so efficient, you won’t even have to unpack. If there’s a better wardrobe organizer out there, we haven’t heard of it. What’s the secret to wrinkle-free, perfectly folded laundry? All you need is the right template. 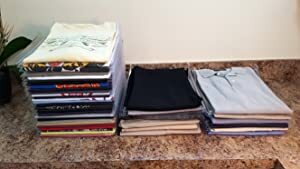 With this you can quickly fold, stack and sort clothes into their proper piles, then re-arrange and stack some more – all without re-folding. Working in a tight space? Simply combine piles and stack taller. 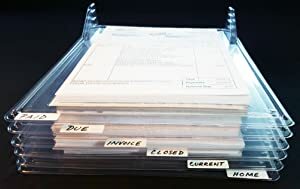 Can work as a Document Organizer as well! This is the new king of office organization. It’s a paper organizer. It’s a coupon organizer. It’s a bill organizer. 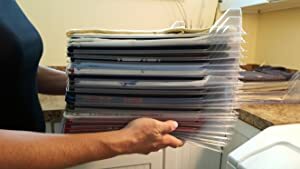 It’s a folder organizer. It’s a literally infinite series of shelves that stack as high as you need, yet take up one paper-sized footprint. You can even spread out your work, then stack it back up when you’re done. I was skeptical at first, but I was getting so fed up with how taking one t-shirt out meant re-folding the entire stack if I took a shirt out of the middle... Big thanks to the people who thought this up--I'm about to order another set...as you can see in the pic, the shelf above could use this! I love this product! It's a bit expensive I guess for some thin pieces of plastic, but its utility makes up for it. Till now to keep my tops looking neat I would fold them over a clipboard to keep the size consistent and everything looking neat. Okay first off this is a product I love and is absolutely needed in most households. I was hesitant due to the price because let’s be real it’s just plastic, but after folding and organizing 100 shirts in an hour I’m sold and will probably buy 100 more. This product is so good I'm writing a review. I received this product a few days ago have successfully transformed my closet, it is exactly what I needed. T-shirts, tank tops, sports bras, etc. all items that are flimsy on their own, stack up beautifully in this brilliantly designed product. They all look neat, I can see what I have & access what I want easily.